The German government recently published its Green Paper on Energy Efficiency and launched a consultation process inviting comments on the ideas put forward in the green book. RAP’s detailed response provides evidence and examples of the essential role that end-use energy efficiency must play in a faster and lower-cost transition to a clean energy economy. The key policy decision is to put “Efficiency First” whenever saving energy is less expensive or more valuable than investing in supply-side energy resources. Efficiency First is a high-level principle that recognizes the central role that cost-effective energy savings can play in meeting European energy, climate, and economic goals. The green book cites Efficiency First as the guiding principle of future energy policy in Germany. RAP has developed a body of work around best practices for energy efficiency and the principle of Efficiency First, based on deep experience in U.S. states, including integrated resource planning and utility efficiency obligations, as well as a number of European examples developed over the last years. RAP’s Berlin office took the lessons learned globally from successful scale-ups of end-use efficiency and distilled them into a streamlined strategy for integrating Efficiency First into Germany’s legislative and regulatory framework. Germany is the first country in Europe to prominently adopt the Efficiency First principle—RAP welcomes this important first step. 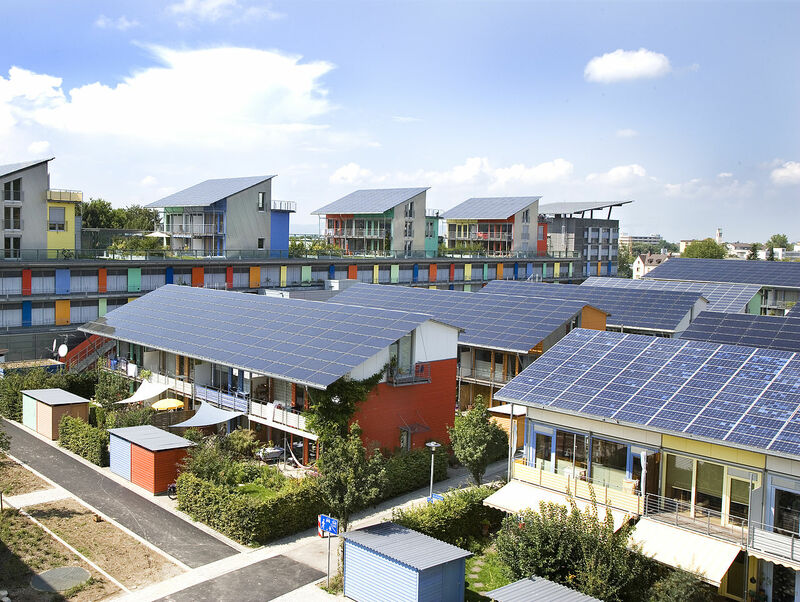 Solar Settlement, Freiburg, Germany. Image by Andrewglaser at English Wikipedia. Attribution CC BY-SA 3.0. The ambition of the Energiewende (energy transition) is high. In addition to its renewables goals, the German government established aggressive targets for improved energy efficiency—a 25 percent reduction in total power consumption by 2050 (relative to 2008), even with the expectation that the heat and transport sectors will drive a significant shift to electricity via heat pumps and electric vehicles. This requires new thinking. The principle of Efficiency First helps to minimise the costs of this transition and increases its feasibility going forward. In the response to the green book, RAP draws on international experience and sets out several concrete policy recommendations for bringing Efficiency First to life. New decision rules and metrics are needed to ensure that energy suppliers and regulators compare demand-side options with supply-side technologies before committing to major energy projects or new market rules. One approach that falls into this category involves applying the levelized cost of energy, which accounts for all of the costs and benefits of saving or supplying one unit of energy over the lifetime of an energy investment or policy choice. A recent study commissioned by RAP, in partnership with the European Climate Foundation and Agora Energiewende, confirms for Germany what international experience in this area has demonstrated: namely, that comprehensive, long-term, and aggressive investment in end-use energy efficiency in Germany will yield substantial cost savings in the power sector. The value of these savings, in levelized costs, is in the range of € 0.11‑0.15 per kilowatt-hour. Simply put, new efficiency is often cheaper than old coal, and deeper efficiency can greatly lower the cost of the needed switch to renewable power. This is powerful motivation to expand Germany’s efficiency programs, such as those delivered by the KfW Bank, and the new tenders for efficiency investments under the National Action Plan. In addition, the Efficiency First principle should be applied to infrastructure investment decisions in the power and natural gas sectors. Decision-makers should, as a matter of standard practice, take a “hard look” to determine whether the outcomes sought through investment in utility systems can be achieved at lower cost and lower risk through energy efficiency measures. For example, major grid investments should only be undertaken after considering whether cost-efficient demand-side options could instead address the need for grid upgrades or extensions. Energy efficiency retrofits in buildings comprise a large portion of the potential for reducing energy consumption in Germany. As part of Efficiency First in Germany, RAP recommends a reform of the property transfer tax in a way that helps building owners to make energy efficiency retrofits at the time of sale, which is often a trigger point for building works. RAP has recently developed such an approach for Germany, drawing on its work in the U.K. on the same issue. At the same time, carefully laid out minimum standards for energy efficiency applicable at the point of sale or rental agreement provide a regulatory option to ensure basic efficiency measures are implemented first. RAP also recommends revisiting the concept of an energy efficiency obligation in Germany as a regulatory tool to assist families and businesses in saving energy and lowering their energy bills on a routine basis. In response to the green book’s treatment of European energy policy, RAP suggests that the 2030 energy efficiency targets should be binding at the member state and European level (similar to other 2030 targets) and be increased to 40 percent to bring them in line with the 2050 greenhouse gas reduction trajectory. Over the coming years, Germany will implement the Efficiency First principle—bringing it to life by adjusting existing and introducing new policies to ensure that the Energiewende is both economical and affordable. Let’s get to work and make it happen. RAP’s full response (in German) to the German Efficiency “Green Paper” can be downloaded here. This blog was originally posted on the Regulatory Assistance Project (RAP) website.